Get Started on Your Psychic Mediumship Journey by Taking Live Classes! 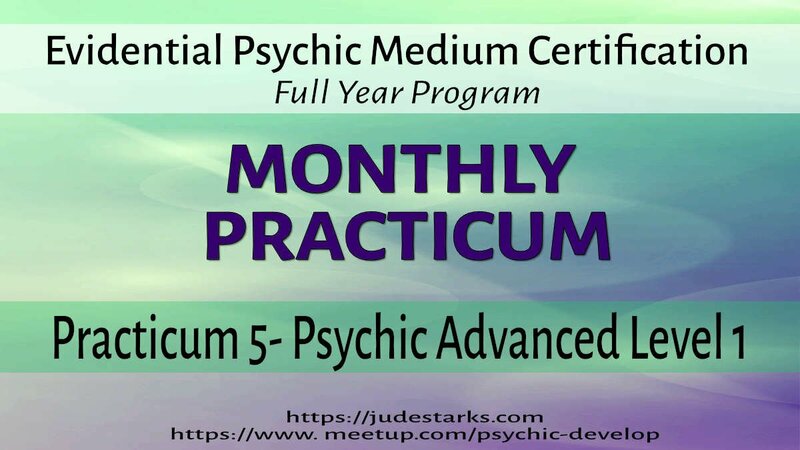 The year long certification course is a complete and comprehensive training for both Psychic and Mediumship Skills. It is a practical and hands on course for all skill levels with live interactive workshops (Online in 2019). In the workshops we cover specific skills and learning concepts each month. The corresponding practicums are very specific for the practice of skills covered in the monthly workshop. We use distinct exercises each built to layer different methods and aspects to expand your abilities. The Workshops are all LIVE Interactive Online workshops. To attend the workshop, you will need to pay for the workshop so an online link can be sent to you to get into the Online Classroom. We use your paid link to send you the invitation to join. 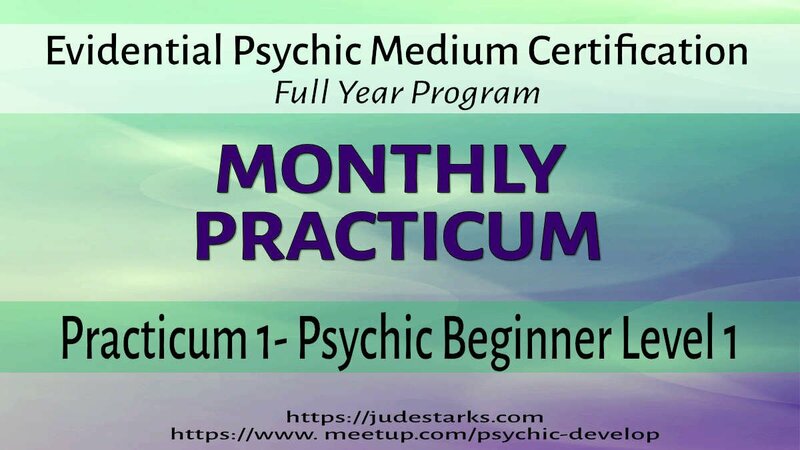 The Practicums are LIVE classes taught in the Denver area at Goddess Isis Book Store, 2775 S Broadway, Englewood, Colorado. we take the essential psychic skills and build on those as we learn connecting to and receiving information from the Spirit world in Mediumship. We dive deep into mediumship processes of linking and holding links to connect to those who've passed. The maximum class size is 20, as I do a great deal of individual assessment and mentoring throughout the year. It is a year long course and sitting for certification requires all 24 classes and the ability to demonstrate both psychic and mediumship skills proficiency. Because we believe that learning should be a continual process, once you've successfully completed the yearlong certification course, you will be eligible to join the continuing mentorship group, where you will gain additional skills to practice at a higher level. Join Us ... Sign Up Here! We begin this year with a free introductory class on Friday January 11 from 5:50 pm to 7:30 pm. In this class we will go over the year program and go through the basic concepts of what the year holds. We will also be doing an assessment of current skills for all of the participants. There is a limit of 25 people. Click the button to be counted for the class. 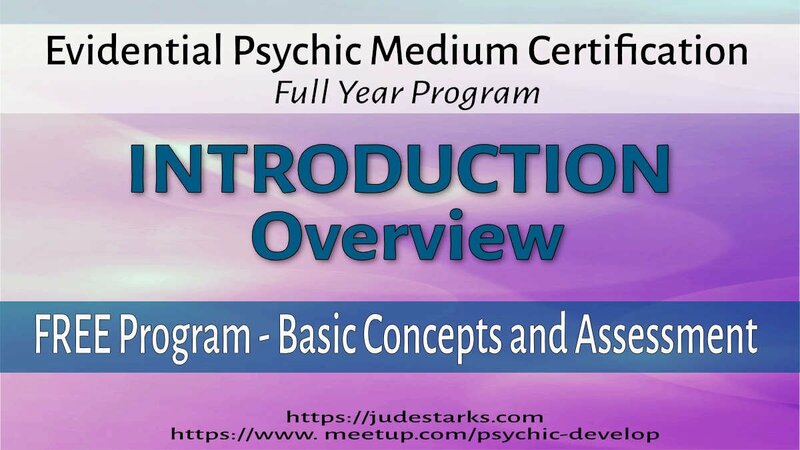 In this class… we will be Beginning with the Basics and learning some fundamental building blocks, assessing where you are now and expanding your knowledge. The series will build on itself and you will want to attend all classes to get the best benefit. We will be doing exercises and practice different skills that we learned about in our monthly workshop. 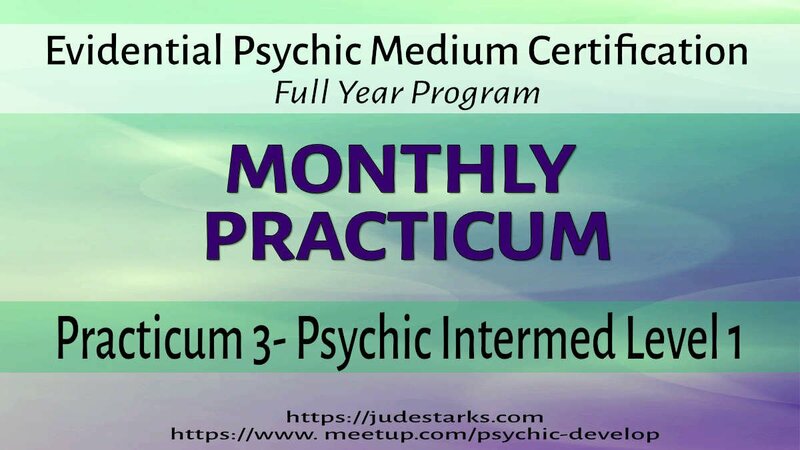 Each practicum follows the curriculum from the workshop and adds new and different skills each month. The circle is required with the workshops for certification. In this class… we will be Continuing with Basics, more fundamental blocks and delving into the mind aspects that can help or hurt us in development and exercises. The series builds on itself, you will want to attend all classes to get the best benefit. Expanding in depth skills, you’re able to actually do basic readings, and have a fundamental knowledge of using layers to read. The series builds on itself and you will want to attend all classes to get the best benefit. Continuing with more information, skills and expanding reading techniques and tweaking your own abilities to open at a deeper level. The series builds on itself, you will want to attend all classes to get the best benefit. Honing your reading skills, adding more information and expertise to techniques to help you bring in more evidence and accuracy. The series builds on itself and you will want to attend all classes to get the best benefit. 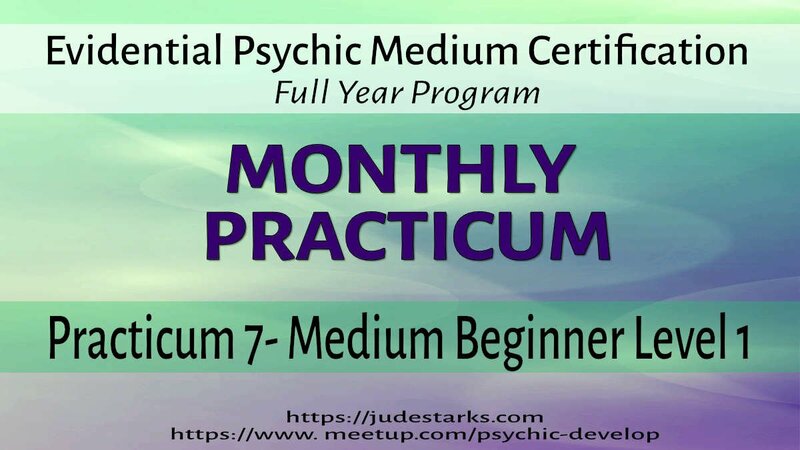 Expanding your skills and abilities and picking up evidence to increase your accuracy and confidence in psychic readings. The series builds on itself and you will want to attend all classes to get the best benefit. 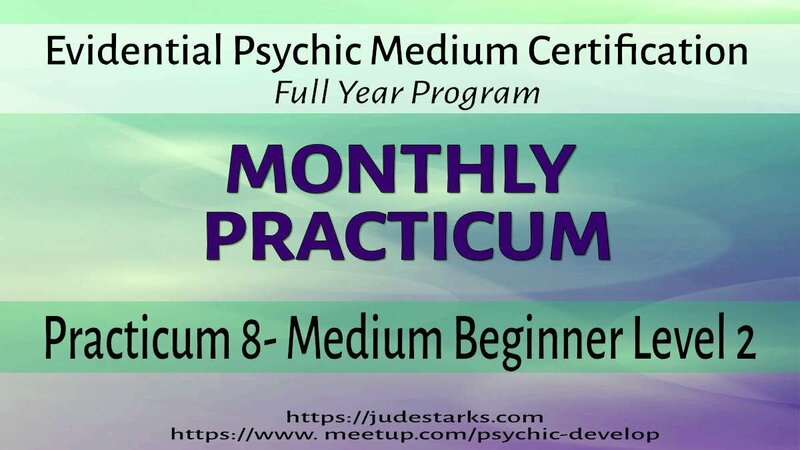 Adding to the expertise gained from the psychic series (class 1-6) we will expand into the basics of mediumship adding new skills, assessing your abilities and learn mediumship skills. The series builds on itself and you will want to attend all classes to get the best benefit. 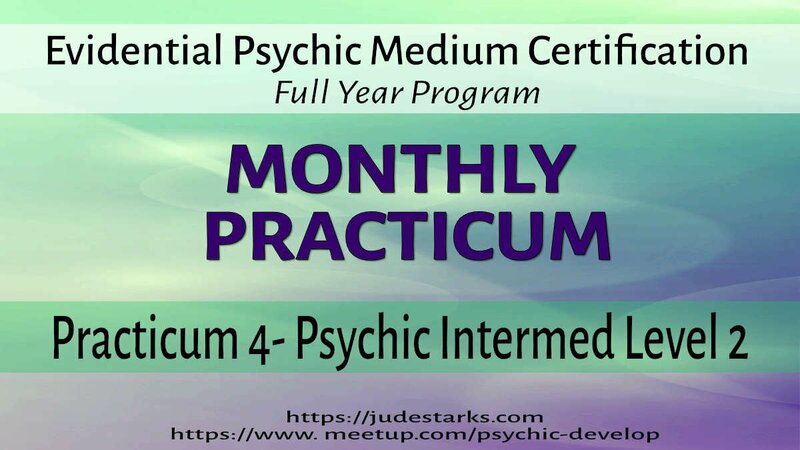 Learning how you connect and tweaking mediumship connecting abilities with new tools and fundamentals. The series builds on itself and you will want to attend all classes to get the best benefit. We will be doing exercises and practice different skills that we learned about in our monthly workshop. Each practice circle follows the curriculum from the workshop and adds new and different skills each month. The circle is required with the workshops for certification. Beginning to develop the discipline and habit of connection and learning to grow and expand the information you are receiving and how you’re receiving it. The series builds on itself and you will want to attend all classes to get the best benefit. Growing and expanding, critical evidence interpretation, symbolic meaning, expertise in handing the spirit connection and myths. The series builds on itself and you will want to attend all classes to get the best benefit. meaning of evidence, practice and readings. The series builds on itself and you will want to attend all classes to get the best benefit. information. The series builds on itself and you will want to attend all classes to get the best benefit. The Practicums are LIVE classes taught in the Denver area at Goddess Isis Book Store, 2775 S Broadway, Englewood, Colorado. The workshops are all LIVE Interactive Online workshops. Because we believe that learning should be a continual process, once you've completed the yearlong certification course, you will be eligible to join the continuing mentorship group, where you will gain additional skills to practice at a higher level. There is a limit of 25 people. Click Here To Reserve Seat and be counted for the class.